The storm last Friday was strong enough to divert my younger son from his holiday journey home from White Plains airport to Allentown, PA for four hours. So while we’d normally just have walked from Grand Central to the Theater District, the tempest forced us underground to the shuttle to Times Square. That’s where the navigational trouble began. Although I pride myself on being able to get around Manhattan with my eyes closed, apparently that doesn’t apply if I’ve been spun around like the blindfolded partygoer about to strike a piñata. The dizzying choice of subway exits messed with my inner compass, and the London-like, low-lying fog didn’t help. I thought we were walking west, but we unintentionally, albeit serendipitously wandered east, right into the bright lights of Rockefeller Center and the lit tree. Dustin hadn’t seen it in person for years, and the spectacle, including the new sparkly Swarovski-encrusted star, made the unintentional odyssey worthwhile. We arrived at our actual destination on 8th Avenue near 47th, a little deflated and disappointed. A massive tourist trap storefront luring tourists in with siren songs of NYC bus tours that would actually mostly show them traffic-choked side streets obscured the seedy entrance to number 777. The only flyer posted in the seedy lobby advertised Trainspotting, which we did not hold tickets for. The only beacon of hope manifested itself in a large red poster atop the first landing of the industrial staircase: Keep Calm and Carry On [insert crown] It’s Only Four Flights Up. The Bard might yet await us somewhere above. We’d come to see Drunk Shakespeare (yup, I’ll see just about anything with his name in the title). Or, as I like to call it: One Play. Six Actors. One Actor. Six Shots. The enthusiastic improv troupe ushered us onto bench seats in a long, narrow library set, handing us each a shot glass of a tame but bourbon-based elixir to tease out our mischievous spirits. The short, bearded emcee (or, as he called himself, the Hasidic Danny Devito) greeted and worked the crowd, gently ribbing and warming us up. By the time he made one pass around the room he’d needled all our Achilles’ heels and memorized all our names. Once the whole audience had assembled, he introduced the play (Macbeth), the cast, and the designated drinker: Danielle, a voluptuous, zaftig, flaming red-haired real life Jessica Rabbit. A server delivered a tray laden with shots of clear liquor. Lest anyone suspected that she would simply imbibe water, she selected a random audience member to choose and down one of the shots. She coughingly verified the high proof. Danielle tossed back the others. Quickly. 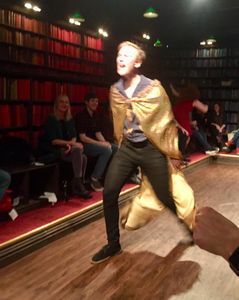 The troupe proceeded to prance and romp through an uproarious rendition of the Scottish Play that would’ve left Shakespeare himself rolling in the aisles. Had there been aisles. It was bawdy and bold, raucous and rowdy. Early Modern English and Modern American. Hasidic Danny Devito secreted another shot to Dustin and me at some point. Danielle had a few more, too, and in her piece de resistance, she took an empty glass, added the remaining contents of several spectators’ cocktails, and tossed that backwash back too. The audience groaned as she swilled that, but she seemed pretty obliviously gleeful, and washed out her damned spots with abandon before her melodramatic death. By the time Macduff did Macbeth in (all the while singing You Make Me Feel Like a Natural Woman), my sides and cheeks hurt from laughing for 90 minutes straight. I had an entirely new perspective on one of my favorite plays and admiration for this group of actors who could get through it so quickly, comprehensively, and uproariously. They did not turn the tragedy into a comedy, but they certainly presented it comically. The fog had lifted by the time we left the theater, and we grabbed some Shake Shack for the jam-packed train back ride back to Westport. The tempest had turned tame, after all.